The prosperous state of Gujarat and the princely land of Rajasthan are predominantly arid regions where agriculture can flourish or fail according to the mood of the annual monsoon rains. This area has long been famous for the cultivation of cotton and indigo and for the early use of mordanted (therefore fast) dyestuffs; indeed the rivers themselves are legendary for their chemical properties, which were said to impart a special brightness to the colors obtained. The terrain of western India is dramatic, but for most of the year there is visible only a landscape painted with shades of yellows and browns, broken by the irrigated fields of rich green and punctuated by clusters of thorn and other hardy trees adjacent to the wells and seasonal lakes. By way of relief to the monotony of these dull tones, the people of the region have a deep-seated need for color. This need is vented in the vibrancy of their clothes, animal trappings and house decorations. The richness of the regions textile culture is indeed evident to the visitor as well as to the follower of fashion in the West. Most of the hand-and screen-printed yardage, the brightly coloured and patterned cotton that is used in the West for summer dress blouse and skirt fabric, comes from Rajasthan. Recently, however, in London as in Delhi, there has been a proliferation of decorated handbags, small rucksacks etc., all made up from embroidery pieces, and much of this ephemeral fashion market has been supplied from the dowries of Gujarati women. Western India lies in close proximity to Iran, the Middle East, Afghanistan and Central Asia, and has strong cultural links with this largely Muslim world. Over the centuries, immigrants and invaders from these neighboring lands have settled here, become assimilated and formed castes within the Indian social structure. 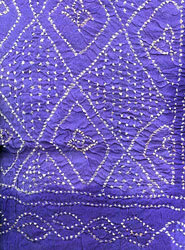 Both patrons and practitioners of the textile arts have keenly felt their influence on textile design and production techniques. The area has always been blessed with busy ports; Surat, Broach and Cambay were the most important ports in Mughal times; and other historic ports embrace Mandvi in Kutch and Tatta at the mouth of the Indus. Karachi (now in Pakistan) and Bombay, the port built by the British, and Kandia, a deep-water port in Kutch, serve the area today. In times past, all of these ports had access to important export markets including the Arabian Gulf, Yemen and the Arabian peninsula, through the Red Sea to Egypt, where Cairo was the entrepôt for goods in transit to Europe as well as to the coast of East Africa; southwards and eastwards the boats rounded Cape Cormorin and Ceylon to trade with Indonesia and on to China. Ocean sailing boats and coastal vessels have carried the textile of western India to all points of the globe since prehistoric times. To the Greek and Roman Empires was sent cotton cloth, then to the Muslim world quantities of the cheap printed calicoes, and then, by the seventeenth century, to Europe the exquisite commercial embroideries and to South-East Asia the venerated double-ikat cloths.